The Vancouver Whitecaps are the first Canadian team to ever qualify for the Major League Soccer playoffs. Vancouver advanced despite being upset 1-0 by the Portland Timbers in their final home game of the regular season. Long after they had gone home, disappointed Vancouver Whitecaps fans still had reason to cheer Sunday night. 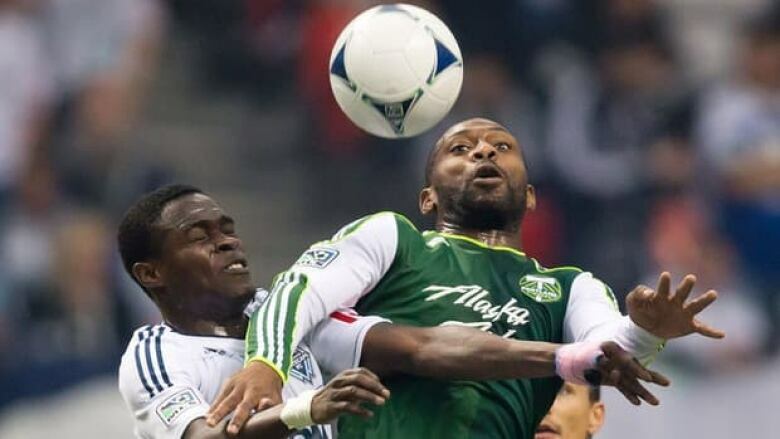 The Whitecaps became the first Canadian team to qualify for the Major League Soccer playoffs despite being upset 1-0 by the Portland Timbers in their final home game of the regular season. The Seattle Sounders came to the Whitecaps' rescue a little while later as they defeated FC Dallas 3-1. The loss eliminated the Texas club from post-season contention and gave Vancouver the fifth and final playoff berth in the Western Conference. The Whitecaps (11-13-9) will play a do-or-die game on the road against the defending champion Los Angeles Galaxy in the opening round. "We'd much rather have taken care of it ourselves in front of our home fans," said Whitecaps striker Kenny Miller. Jack Jewsbury scored in the 39th minute for the Timbers (8-16-9) who only had pride to play for. "We didn't have, really, too many people who performed to their highest standard," said Vancouver coach Martin Rennie, who was "surprised and disappointed" with the result. The Timbers posted their first road victory of the season and also ended a six-game losing streak before a disappointed sellout crowd of 21,000 at B.C. Place Stadium. Rennie, who usually chooses his words carefully, did not pull any punches as the Whitecaps failed to handle the pressure of a big game. He was disappointed that Sunday's loss came after the Whitecaps also lost a crucial home game to Toronto in Nutralite Canadian Championship play that enabled the Reds to prevail. "At the moment, the team hasn't quite got the culture that it needs," said Rennie. "It was the same when we played [Toronto] in the Canadian cup. The team didn't perform, and I thought we had got over that with the last couple games against Seattle [a 0-0 draw] and Chivas, where we did actually perform under a lot of pressure. "So I thought that team was ready to do that, but it's going to have to prove that it's ready to do that now in the next game [Saturday in the club's regular-season finale in Salt Lake City.] It's frustrating, it's disappointing, because to be successful and get to where we want to get to, players have to be able to play in big games. "We've created big games because of what we've done earlier in the season. We need to get to the point where we win big games." Portland's next big game will have to come in 2013, because the Timbers have long since missed the playoffs. But, playing for nothing but pride, they were able to hold the Whitecaps at bay, although Vancouver controlled much of the play. However, Timbers interim coach Gavin Wilson did not take any satisfaction in briefly delaying Vancouver's playoff party. "This is about supporting our fans in a tough season and for sticking by us and for being good to the organization and good to the players," he said. Jewsbury's goal was his first goal in two and a half months. He last scored against Dallas on Aug. 5 against Portland. Steven Smith started the scoring play from the left flank, sending a rolling cross to Franck Songo'o near the top of the Vancouver 18-yard box. Songo'o then tapped the ball back to Jewsbury and he quickly fired his shot home. Wilkinson said it was fitting that Jewsbury gave their side the win as they prepare to get better for next season. "He's had a great season in many ways, and he's been a good captain for the group," said Wilkinson. "So for him to score, for him to get the group to really believe in what we were doing coming into this game and coming into the second half, it was tremendous for the group. … Tonight was a good sign that we're going in the right direction." The Whitecaps controlled much of the play following the goal, but did not generate dangerous chances. "A spark was definitely missing tonight, which was really disappointing — considering the magnitude of the game," said Whitecaps striker Kenny Miller, who did not generate a shot and rarely touched the ball. Rennie was disappointed with the club's lack of collective movement and inability to make the final pass necessary to create quality scoring chances. The Caps coach started Miller and Camilo up front following their success in Vancouver's convincing 4-0 victory over Chivas USA on Oct. 3. Top scorer Darren Mattocks, sidelined with a hamstring injury suffered two games ago against Seattle, dressed as a reserve, along with fellow Jamaican Dane Richards. Mattocks was one of three second-half substitutions that Rennie made, but the Jamaican striker could only manage to bounce a header toward the Portland net, and Timbers goalkeeper Donovan Ricketts chased it down. "It was a tricky decision, but I think [Mattocks] wasn't quite fresh enough to start," said Rennie. "Winning 4-0 the game before, we went with the same starting lineup." In the 14th minute, Vancouver almost capitalized on an own goal as Portland defender Smith sent the ball back hard to Ricketts, but the goalkeeper kicked it out. In addition to Mattocks, Rennie tried to go for even more offence with the insertions of midfielder Dane Richardin in the 61st minute and Omar Salgado in the 77th. It was Salgado's first MLS appearance since May. He suffered a broken foot while playing for the U.S. under-20 team in Uruguay in June.